The lost sheep with a story to tell from Jaipur goes to Amritsar next month, to pay homage to an Indian Soldier I met in Delhi who showed me an enormous model of the Golden Temple in the President's House complex, yet remarked he did not have the time or luxury of travelling. Regardless of where he's deployed now, safeguarding the city or assisting in Kerala, I would like to say one day, I went to the Golden Temple for him, and went on to pay respects at the ancient battlefield of Kurukshetra, where much wisdom and knowledge was told to Arjuna many thousands of years ago. I told my company this was a more pilgrimage type of trip; I am less interested to mingle with tourists but love to visit religions sites, walk with the Indian people again where I felt much more welcomed and safer than back home (amazing but true). 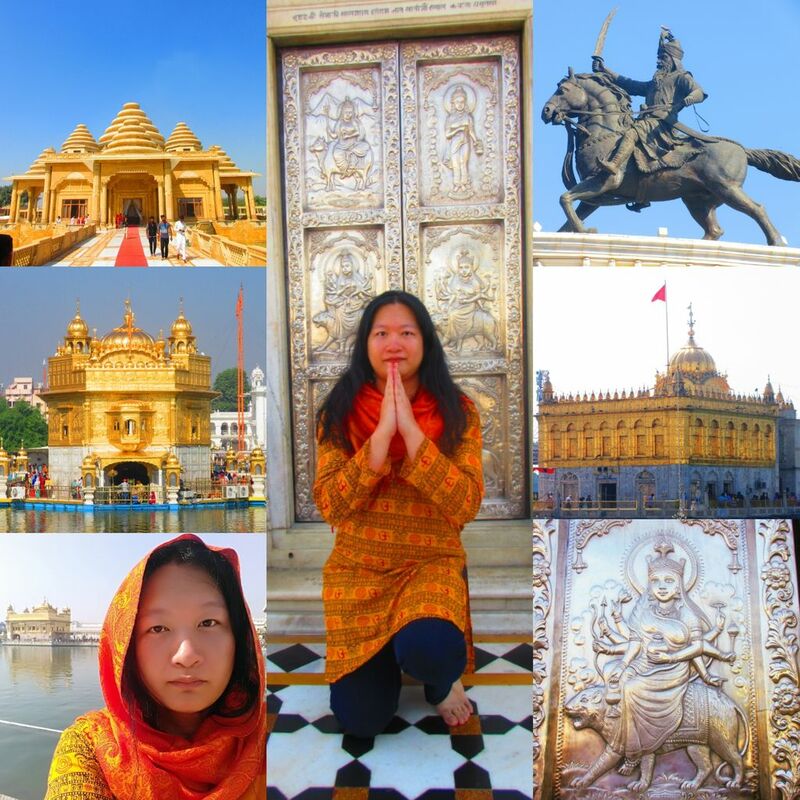 The last six months since my last trip to the Delhi Golden Triangle was enough inspiration to start life anew, cumulating in appearing on Indian TV telling a tale that regardless of nationality or culture we would stand with Hindustan in the wake of recent events. And with this story and the tale of the past life from my new friends in Jaipur in my career for the first time I forged a peace between various companies to work together as one, gone be the old days of misunderstanding and suspicion. Quoting the Gita got me a job placement at a "desi" tech company, so what better than to go to Kurukshetra in person to see the ancient battlefield for myself. It's not the length of the trip that matters.. it's what you accomplished in it. "For my birthday - Saraswati's Dreams!" It's been 6 months since I brought an ancient legend home from Jaipur. Stories of duty and sacrifice led to a new beginning in life. I now work in an Indian Company that encouraged me to pursue my dreams, tell my stories, and make the world a better place... wearing traditional clothes to meetings! For the past few months, like the story of Jodhaa, Princess of Jaipur I forged a peace between warring factions and set my sights to visit India again, this time for my birthday! It was just a few weeks ago when I rang up GeTS Holidays, told them, "You know my nickname from Jaipur - plan for my birthday." "I brought home from Rajasthan this silver Saraswati statue. Each night in my dreams I saw temples across the water in a City of Gold. I'd like to tell my tales on the Battlefield of Kurukshetra, where all our wisdom and knowledge was chronicled 5 millennia ago..."
Like a genie from a lamp the itinerary was created from scratch - a full custom tour no less! Soon I found myself on these legendary curved wings of carbon and steel, aboard a Dreamliner on my way to see the Golden City for real. But wait, let's make things better, like my previous 8 Days in the Golden Triangle, save the main attractions for last. I am not there to be sheltered like a tourist. Let me be with the people of India. With my love for the land and all its history there will be magic. And then, when I return to Amritsar, I would walk amongst the crowd perfectly comfortable, like everyone was family to me. Everyone today says travel in India alone has its risks, and they even say the age of minstrels and poets are long gone... so it was I made it my mission to tell the tales of Rajputi legends with my own tongue, having done duty and sacrifice for the Mothers of India (a story for another time). Go to India, they said, find your past life. You will like it there. So it was I visited the great Banyan tree that bore witness to the actual Kurukshetra War, paid respects to all the deities of the land, and received blessings from all the wonderful people I met on the road from friendly Amritsar, beautiful Chandigarh, and onwards to the serenity of Kurukshetra where I performed the rites I wished a year to perform - a Hindu's wish to commemorate a first year in a new way of life. Now the wonderful hospitality of Punjab will never leave my thoughts. It inspires me to keep doing good, keep sharing the stories that led to knowledge, wisdom, and liberation from oppression caused by this past wonderful year of cultural exchange. Imagine, two weeks in India to conquer three decades of oppression and misinformation! They don't call this land Incredible India for nothing. I even loved partaking in the patriotic songs and dances at the Wagah Border! For being (mistakenly) called those wonderful names of devotion and honor, so have I dedicated myself to serving the Hindustani people in work and spirituality. For now duties call, and the Adventures of the Lost Sheep and the Temples of Gold had ended, but one day, I shall return. Next year I will bring my stories back to the land which they were born. A Rajasthani summer adventure for a lost sheep that dared to walk alone in a foreign land, trust the locals, and found new names to share knowledge and wisdom by. It will be duty, to pay respects in kind.